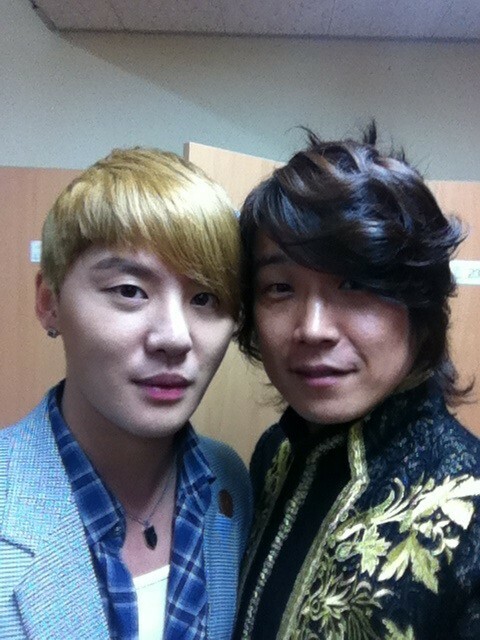 A photo of JYJ’s Kim Junsu attending the first birthday party of musical actor Min Young Ki’s son has been revealed. 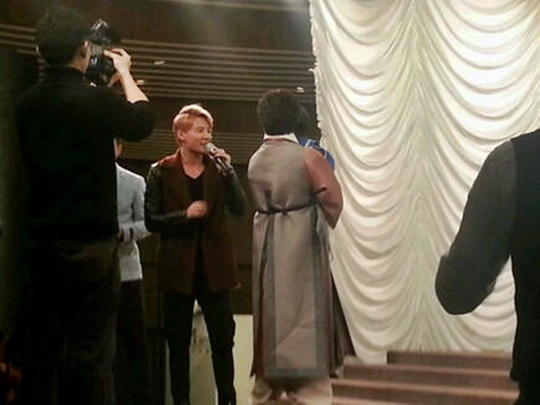 The photo in question was taken on the 20th at the first birthday party of Kim Young Ki’s son Haram, and shows Kim Junsu performing a congratulatory song. Musical actor Min Young Ki revealed he goes to the same graduate school with JYJ‘s Junsu and Super Junior‘s Sungmin. 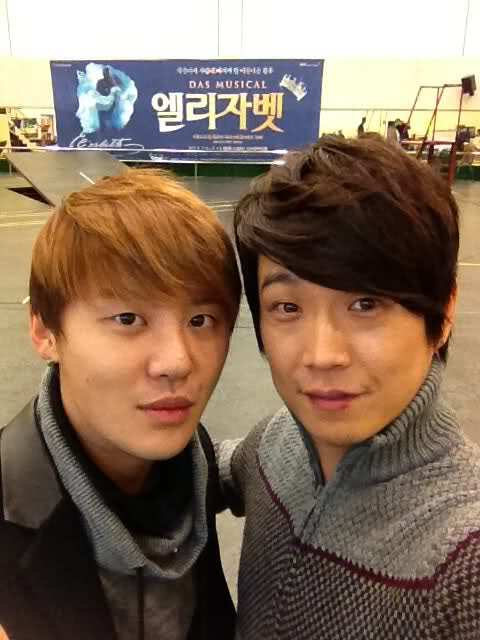 On the 13th, the actor tweeted a selca of himself with Junsu, writing, “Proving our relationship!!! What kind of relationship do you think we have???“. 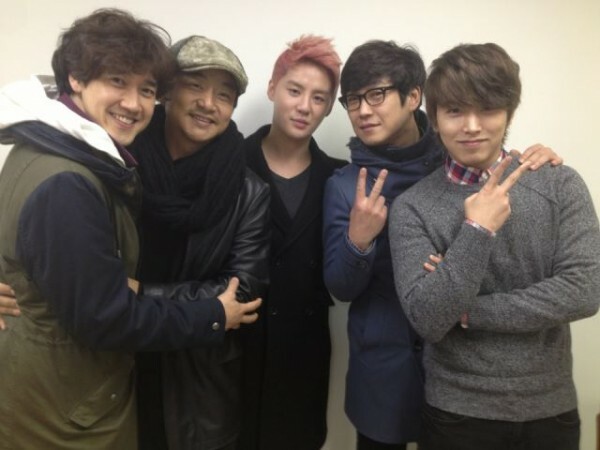 A few minutes after the tweet, he tweeted again, this time attaching a group photo that included Sungmin as well. He wrote, “The answer is graduate school ^^We go to the same graduate school!!!“. He then tweeted, “Junsu’s finger!!! He was making a peace sign, he wasn’t giving anyone the middle finger“, explaining his first photo with Junsu where the cropping of the photo made Junsu’s peace sign look offensive. 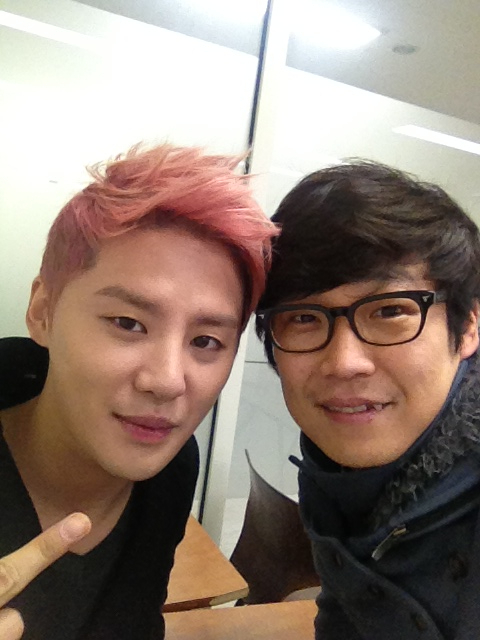 He uploaded another photo, cropping Junsu’s hand gesture out completely. JYJ member Kim Junsu received (birthday) wishes from his artiste colleagues on his birthday.Kim Junsu, who celebrates his birthday on the 15th, received congratulatory messages via Twitter from artistes including Kim Jaejoong, B2ST’s Lee Gi Kwang and actor Min Young Ki. 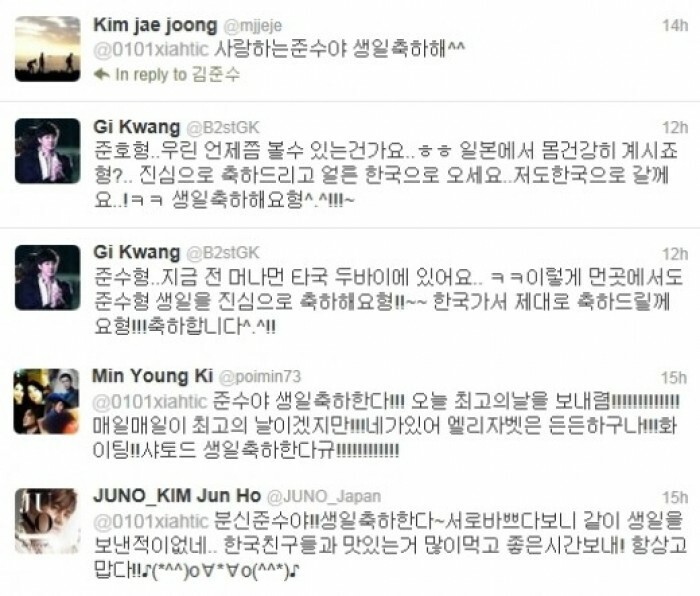 They left mentions for Kim Junsu, wishing him on his birthday, with Kim Jaejoong’s saying “To my beloved Junsu, happy birthday”, B2ST’s Lee Gi Kwang said, “Junsu hyung.. I’m in Dubai right now, a foreign country so very far away from you.. keke Even from such a far away place, I want to sincerely wish you a happy birthday, hyung! !~~ I’ll give you a proper birthday wish when I get back to Korea, hyung!!! Happy birthday^.^!!”. Actor Min Young Ki said, “Junsu, happy birthday!!! Have the best day ever today!!!!!!!!!!!! Though I’m sure every day is the best day ever for you!!! I feel so great about Elisabeth because you’re with us!!! Hwaiting!! 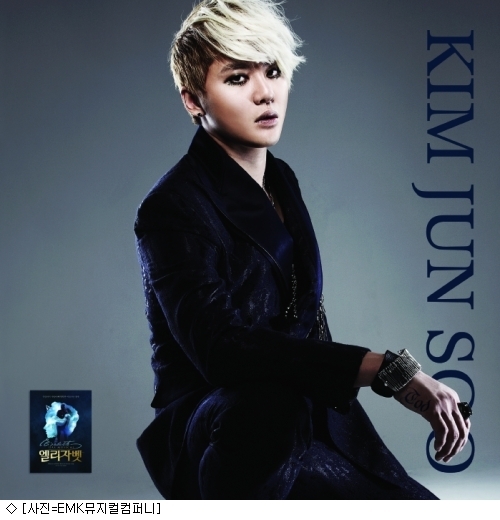 Happy birthday Xiah-Tod!!!!!!!!!!!”. In particular, Kim Junsu’s elder twin brother Kim Junho also revealed his regret of not being able to spend his birthday with his younger brother by saying, “Junsu, my other half! Happy birthday. I realized that we’ve never spent a birthday together because we’re both so busy.. Eat lots of great food with your Korean friends and have a great time! I’m always grateful to have you”. Kim Junsu’s fans also created a webzine that included a congratulatory video from celebrities such as Lee Dong Wook, Kim Seon Ah, Seo Beom Seok, Bae Hae Sun, Kim Hyun Joong and Park Sung Gwang. In response to these, netizens expressed, “Junsu-oppa Happy Birthday”, “You must spend the happiest day ever today”, “Have you had seaweed soup?” among other responses. 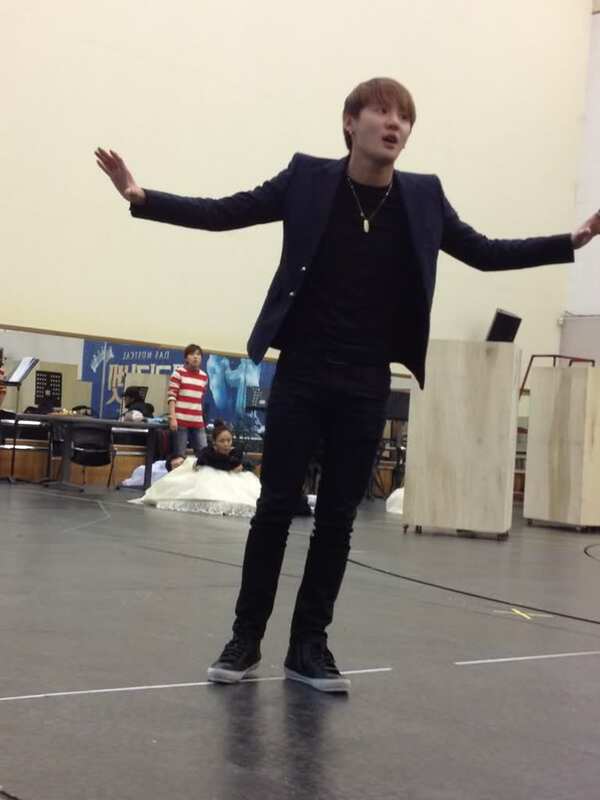 On another note, Kim Junsu is practicing intensively in light of the performance of the Musical Elisabeth in 2012. This post will be updated throughout the day with tweets by JYJ. A time will be added with each tweet as our translators will not always be able to provide instant translations This post includes tweets from 6am KST, November 15th to 5:59am KST, November 17th. 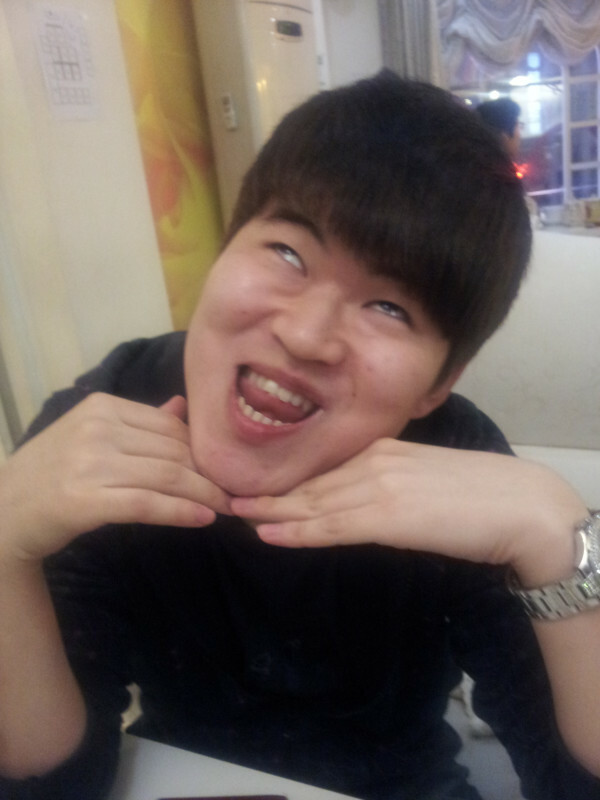 (Min Young Ki, 10:27am KST) @0101xiahtic Junsu, who terrorized Han Sol keke What’s Han Sol to do now!? keke I should go to White Lion and play some games… Let’s set up a date for that!!! Dong Seok keeps saying we should play together soon? ?